Although she didn’t hit the limelight until February 1997 with a publication in Nature, Dolly-the-most-famous-sheep-in-the-world was born 20 years ago, on 5 July 1996 in The Roslin Institute in Edinburgh. Being the first mammal cloned from adult cells by a team led by Ian Wilmut, Dolly changed the way we look at the up-to-then-supposed irreversibility of development and paved the way for many other forms of reprogramming. Despite suffering from several illnesses early in life, including the well-known arthritis, Dolly was eventually humanely put down on 14 February 2003 when she was found to suffer from a viral form of lung cancer. Dolly’s remains are still on view in the National Museum of Scotland in Edinburgh. Concerns about a potential effect of cloning on premature or accelerated ageing have recently been addressed in a study from the University of Nottingham which shows that 13 cloned sheep, four of which clones from Dolly herself, aged normally. To celebrate Dolly’s 20th birthday The Roslin Institute is organizing a series of scientific and public events to examine and celebrate her legacy. Public events include a debate in the ‘Cabaret of Dangerous Ideas’ as part of the Edinburgh Festival Fringe, a public lecture and discussion featuring Professor Sir Ian Wilmut, Professor Angelika Schnieke and Noble Prize laureate Professor Shinya Yamanaka in the Surgeon’s Hall Museum in Edinburgh, and a public lecture by Sir Ian at the Virginia-Maryland College of Veterinary Medicine, Blacksburg, Virginia, USA. A number of Dolly-related exhibits will also feature at The Roslin Institute Open Day on the 8 October. There will also be a scientific symposium on 2 September in The Roslin Institute Auditorium that will cover the latest advances in research fields that are linked to Dolly: animal biotechnology, stem cell pluripotency and regenerative medicine. Although the main auditorium is now full, it is still possible to register for a seat in adjacent rooms where the talks will be live-streamed. 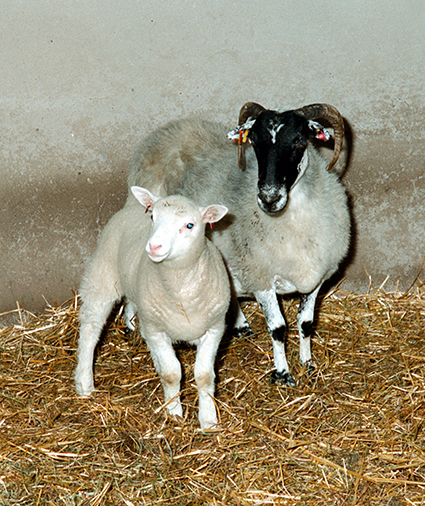 Dolly as a lamb with her Scottish Blackface surrogate mother. 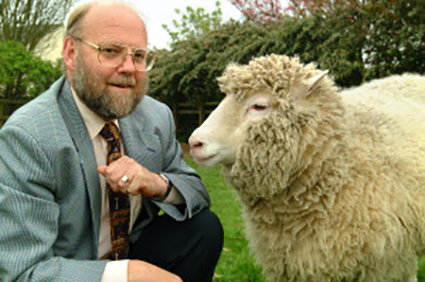 Dolly with Professor Sir Ian Wilmut, who led the research which produced her. • Governance, including reports on the transposition of 2010 EU Directive aimed at harmonizing animal welfare standards throughout Europe that has a lot of impact on our work but is still in a phase in which the new regulations are being implemented in daily routines. The stream also addressed active information of the public and ways to conduct an ethical review process. Aurora Brønstad, who also presented at TT2016 in Prague, spoke on the important topic of harm-benefit analysis of animal experiments [1, 2]. • Joint programs across Europe, including education and training, competence management, and 3Rs programs, to name just a few. • Safety issues with a strong focus on health monitoring of aquatic, amphibian, and rodent species. Moreover, this stream included topics such as occupational health and safety and best working practices but also best practices for husbandry and care, quality of feed, water, and enrichment. • Common diseases of humans and animals. This stream addressed disease and disease models for metabolic disease, cancer, and also infectious disease including zoonoses. It also included presentations on BLS3 facilities and research with non-human primates. • Animal models and animal experiments. For this session I had been asked to convene a session with the title “Genetic modification – technologies and pitfalls”. Together with Ann van Soom, Tom Vanden Berghe and Lluis Montoliu, we informed the audience about the latest technologies in the field, the relevance of the non-coding genome, the threat of passenger mutations, and epigenetic effects. Other sessions in this stream discussed experimental design and reporting, how to process, share, and review acquired as well as existing data, imaging techniques, and various experimental paradigms. In general there was a strong focus on animal welfare, especially on refinement of procedures, which was present over all streams and sessions. Much of the conference was under the influence of the still ongoing implementation of the regulations of the EU Directive on animal experimentation. Due to the importance of European scientific activities in the world, the pressure on scientific publishers to adopt higher animal welfare and reporting standards, and tight cooperation with countries outside the EU, namely the United States, these regulations will impact on animal experimentation worldwide. The same is true for health standards where FELASA guidelines have already become a gold standard. 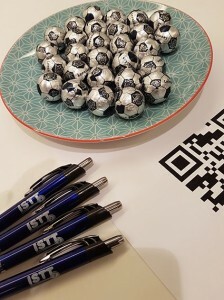 Although FELASA Conferences draw an audience quite distinct from our TT Meetings, there is a small but important overlap in interest. I am convinced that the ISTT should keep on striving to foster a vivid exchange with FELASA and the laboratory animal science community. 1. Bronstad, A., et al., Current concepts of Harm-Benefit Analysis of Animal Experiments – Report from the AALAS-FELASA Working Group on Harm-Benefit Analysis – Part 1. Lab Anim, 2016. 50(1 Suppl): p. 1-20. 2. Laber, K., et al., Recommendations for Addressing Harm-Benefit Analysis and Implementation in Ethical Evaluation – Report from the AALAS-FELASA Working Group on Harm-Benefit Analysis – Part 2. Lab Anim, 2016. 50(1 Suppl): p. 21-42. 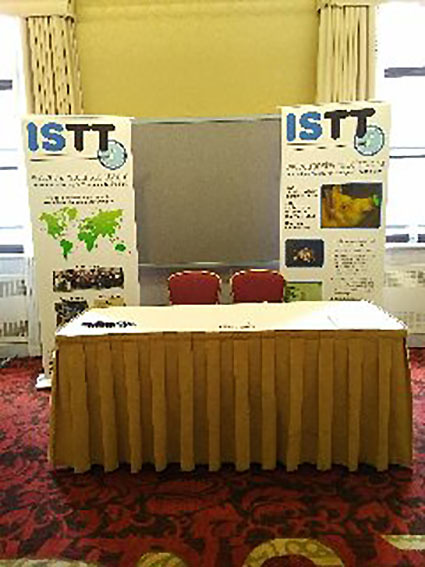 On June 11-14, 2016, the ISTT hosted a booth at the 55th CALAS annual symposium that was held in Toronto, Ontario, Canada. CALAS, the Canadian Association for Laboratory Animal Science, is a national association dedicated to providing high quality training and educational resources to animal care professionals across Canada. CALAS has almost 1,000 members and supports a diverse group of animal care attendants, animal health technicians, and veterinarians. It provides training and certification programs recommended by the Canadian Council on Animal Care (CCAC). The theme of this year symposium attended by 400 participants was: “The dirt on germs: the good, the bad, the unknown”. 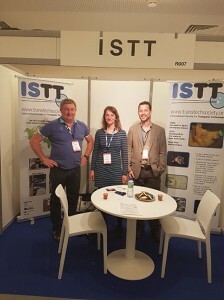 Marina Gertsenstein attended the meeting, both to represent the ISTT at the booth and to organize a workshop on Current Technologies in Mouse Genome Manipulations at The Centre for Phenogenomics (TCP). At the booth, ISTT information flyers describing the benefits of the membership and pens with ISTT logo were handed out. 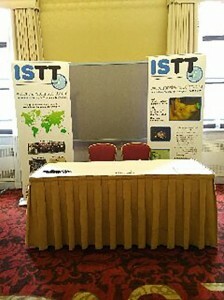 Several attendees expressed interest in becoming the members of ISTT. The highlight of the scientific session was the talk of Dr. Kevin C. Kain, Canada Research Chair in Molecular Parasitology. In his keynote address he described his research on host-parasite interactions responsible for major global health threats such as malaria and HIV and first-hand experience with the clinical problems. This leading researcher is developing effective therapeutic interventions using animal models to determine the molecular basis for clinical outcomes of life-threatening infections and to translate this knowledge into novel therapeutic interventions.